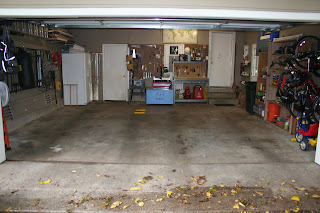 We started the Great Fall Clean Out this past weekend by straightening out the garage. Ahh, what a feeling it is to now look at how clean and organized it all looks. There's something about accomplishing a big task like this that makes you feel so satisfied. While the garage wasn't terrible before, it just needed a good clean out and some reorganization. The storage room was the worst offender... the Land of Misfit Junk. Unfortunately, when a space begins to get unorganized it's hard to get in and put things away properly. You could barely squeeze in the door it was so full. The question everyone asks when you work on something like this is... "what do you do with the kids?" They enjoy some unstructured playtime... and they pitch in with little jobs here and there. 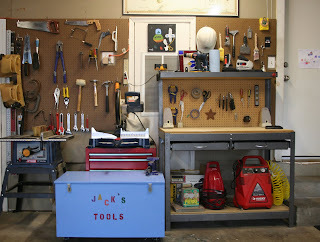 The best thing with a garage is how you can use the wall space to help get things off the floor. We just used some inexpensive hooks (in the garage dept. of Lowes) to get extension cords, ladders, and other items off the floor. We used larger hooks for hanging the bikes against the wall. Then we categorized the items by shelf: sports, gardening, car wash supplies, tools, etc. All that paint, now organized in the storage room. The garage is the last part of your house you see when you leave and it's the first to greet you when you arrive... this is now a much happier looking home to drive up to. What more inspiration? Check out some clean outs here and here. Next week we're tackling closets. Are you ready? There's still time to join in - just leave me a comment if you'd like to participate and I'll add you to the list!